As fall approaches you are likely doing a variety of garden chores from cleaning up spent plants to planning your fall vegetable garden. Don’t forget to re-plant some of your favorite herbs for an extra harvest before the snow flies. You may be surprised to learn that several herbs will thrive in the fall months and be ready to harvest before being damaged by frost. Try a few of these in your fall garden. Anise (Pimpinella anisum) has a licorice-like flavor and is often used in drinks, candy, soups and other dishes. It is also used medicinally to treat menstrual cramps and coughs. The seeds are what is valued from this herb but you can also use the leaves fresh. Its delicate white flowers make it a pretty accent in your garden as well. Normally anise is planted in the spring, but you can also plant it in early fall. It takes about 120 days of frost free temperatures for it to reach maturity and allow you to harvest the seeds, so take this into consideration when you are planning your fall garden. If you want seeds, you’ll need to start it early unless you live in the southern part of the country. Plant anise among your cabbages to help repel pests and attract beneficial insects. You can also plant it in pots, extending the growing season by allowing you to bring it indoors if the weather gets bad. This herb prefers well-drained soil with plenty of organic matter to keep it well fed. You can enjoy the leaves in your cooking even if you don’t have enough time to get seeds. Mature plants can be cut in the late fall before the first frost and hung upside down with a paper bag over the heads to catch the seeds as they dry and drop. Basil (Ocimum basilicum) grows quickly and it loves the cooler temperatures of fall. Plant seeds about ¼ inch deep in rich, loose soil. Cut the tops frequently to use in your kitchen or the plants can get leggy. If a frost is expected, cover your plants to protect them. 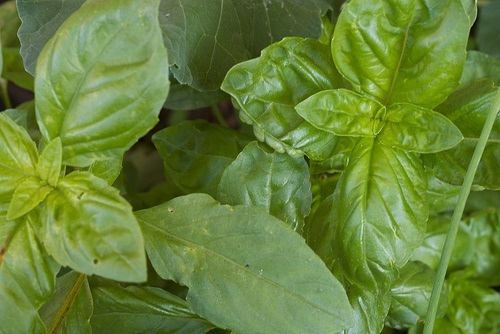 If you have a sunny window or a grow light, basil can also be grown in containers. Bring it indoors when the weather becomes too cold and you can continue to enjoy it fresh in your favorite dishes. Be sure to freeze your surplus so you have plenty to use year round. What you call this herb depends on the part you use. The seeds of Coriandrum sativum are referred to as coriander; the leaves are called cilantro. Either way, it is a useful herb that will thrive in your fall garden. This herb grows easily in rich, loose soil if the seeds are planted about ¼ inch deep. It is even mildly frost tolerant so a very light frost may not do much damage, but you should still try to cover it if you can. Don’t forget about indoor gardening if you want to continue to enjoy fresh herbs through the winder. Herbs like chives, rosemary, lemon balm and mint can be grown in pots indoors as long as you are careful about humidity and light requirements for each plant. Herbs are easy to grow and using them fresh adds a new dimension to your cooking. It is well worth it to keep them growing as long as you can.